British watchdogs are planning to ban sales of popular cannabinoid supplement CBD oil. CBD sales have rocketed in Britain over the past few years, with recent reports indicating that the global CBD market could grow by up to 700% by 2020, with a potential value of $2.1 billion (£1.6 billion). Over 300,000 people now regularly use CBD in the UK. Despite CBD’s overwhelming popularity, a fresh blow has been dealt to one of Britain’s fastest growing markets. British food watchdogs have decided to reclassify cannabidiol (CBD) as a “novel food,” meaning it will now need to go through an arduous approval process. 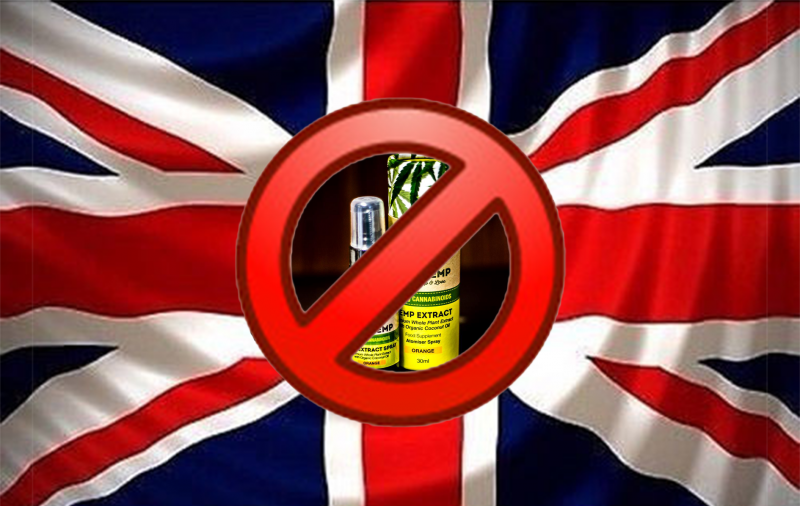 Local council trading standard officers will be asked by Britain’s Food Standards Agency (FSA) to remove CBD products from shops until the approval process is finished. Reports imply this process could take up to 18 months. The proposed new system could cripple local retailers of CBD oil, as they would be mandated to show that CBD products, are safe and indeed have the medicinal effect advertised by companies and retailers. Reclassification could be financial suicide for producers of CBD products, dealing a heavy blow to the established and emerging legal cannabis/hemp farms which are cropping up to meet growing demand. “Trading Standards have rights to enter your premises and inspect stock to determine its novel status. “Cannabidiol oil has direct effects on the endocannabinoid system in the brain, enhancing the effects of other brain chemicals to reduce pain perception, relieve anxiety and stress, improve sleep and lift mood. A product is defined as a “novel food” if it cannot be shown to have been in safe, long term before 1997. Other supplements which were recently reclassified include Vitamin K and chia seeds. What will this mean for those selling, and often making a living from, CBD? Sellers of CBD are already prohibited from advertising, to even mentioning, Cannabidiol’s medical properties. These new rulings could bring in heavier crack downs on those blatantly flaunting the law. Wider implications could be the closing of shops while this ban is in place, forcing patients to either buy CBD on the black market like regular cannabis, or worse, return to dangerous, life-threatening pharmaceutical medications.